CrossFire Aerosol works effectively by combining two active ingredients in order to provide a quick knockdown and long residual effect. This insecticide can kill bed bugs in all life stages from eggs and nymphs to adults. It is distinctly made to combat and kill bed bugs that are pyrethroid-resistant. Also, the toxicity level is very low, reducing hazards to non-targeted animals, humans, and the environment. It can be applied directly on sofa cushions and mattresses, when followed by the product label. It is non-repellent and non-staining. Residual control starts working within minutes and the direct application of this insecticide provides effective control in less than 5 minutes. Use the convenient applicator for crack and crevice treatment. Spray bed bugs and eggs directly wherever possible. Spray surfaces thoroughly, paying special attention to areas where bed bugs and their eggs hide or harbor, such as in and around non-food areas including on and around as non-food areas as well as other nonwashable items that may come in contact with bed bugs such as luggage, shoes, and backpacks. If treating a pet’s living environment, spray on and around pet beds, pet bedding, floors, pet sleeping areas, and furnishings. Pet bedding must be washed before reuse. Do not spray product directly on pets. Allow treated surfaces to dry thoroughly prior to being contacted by people or pets. Restaurants, schools, warehouses, offices, apartments, hotels, nursing homes, hospitals, kennels, motels, kennels, shelters, modes of transportation, theaters, mobile homes, factories, grocery stores, dormitories, day care facilities, shelters, rest areas, waiting rooms, garages, new construction, cellulose insulation, cotton batting, industrial transportations such as: buses, taxis, aircraft, trucks, moving vans, trailers, recreational vehicle, recreational buildings, campers, ships, boats, ferries, trains, yachts, cars and animal transportation vehicles. Pet sleeping quarters, pet bedding, floor and floor coverings where pets are kept. Mattresses, carpets, box springs, headboards, floors, baseboards, baseboards, floorboards, millwork, bed frames, headboards, wall hangings, non-upholstered furniture, door and window frames, walls, closets, window treatments, beneath floor coverings. The can was very easy to use. It even included a button with a straw on it. It had plenty of spray in it and sprayed easily. But I still have evidence of the smaller nymph types. I am now using Spectre 2 SC, in an attempt to have them take it back to their nests. Just did a second treatment last night. Taking back the apartment with different weapons, one battle at a time. Will CrossFire Aerosol work on ticks? CrossFire Aerosol is distinctly made to combat and kill bed bugs that are pyrethroid-resistant for indoor use only. Ticks are not on the label for this product. Depending on how much area you are needing to treat for and type of application, weather it be indoors or outdoors or both, please refer to our tick page which will contain all products that you can use to treat for ticks. Does CrossFire Aerosol have a strong odor? How long does the odor last and how strong is it? 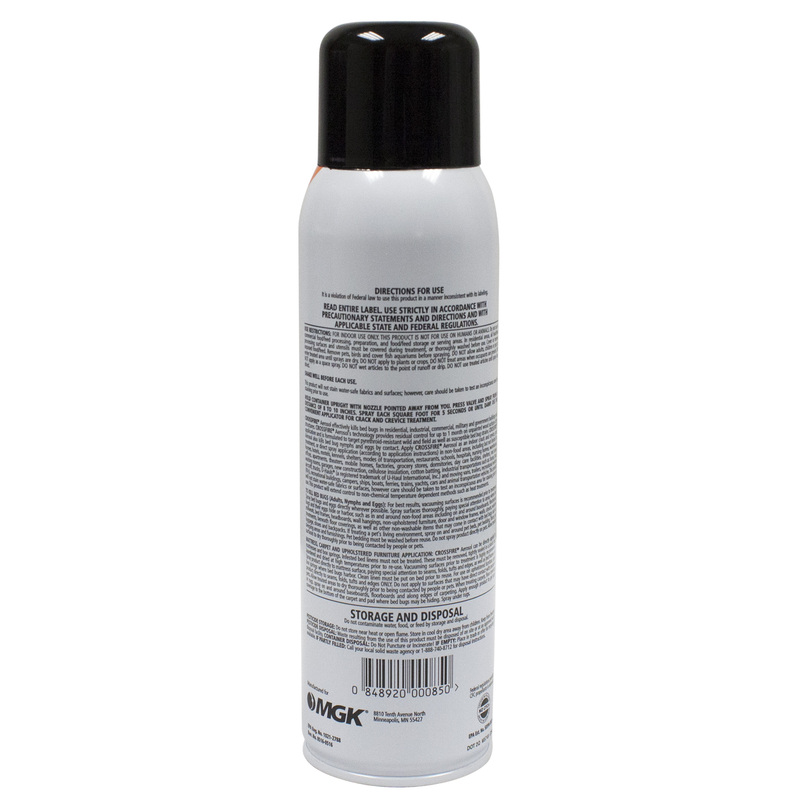 The manufacturer describes CrossFire Aerosol as a low odor product. Once the treated area is dry any odor should dissipate. How area will one can of CrossFire Aerosol treat? I have 3 12x14 bedrooms. Per the manufacturer, the amount of CrossFire Aerosol used will depend on the applicator and how much is applied in a particular spot. One can will likely not be enough to treat the rooms listed. We would suggest using Crossfire Concentrate for better coverage. How long does the residual of CrossFire Aerosol last? The residual of CrossFire Aerosol is about 4 weeks.